James was born in Pensacola, FL and raised in Nashville Tn. He took an interest in cooking at an early age, helping his mother in the kitchen with dinner and spending time cooking with his grandmother in Texas. Having set out on his own at 18, he worked at Bailey’s Sports Bar for several years learning every position in the restaurant. Having always had an interest in the arts, he craved to work at a more upscale restaurant, being able to express some creativity and learning from more experienced and inspired chefs. He took a job at Lynn’s Paradise Café, working sauté in the mornings. He then ventured on to Deke’s Marketplace Grill working under John Varanese. 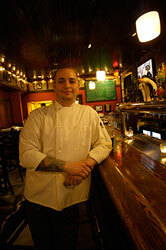 Deke’s became Bistro 301 in 2005 and James became the head chef that year. His focus on cuisine is traditional classic pairings with a twist, from Spanish to Greek or traditional French with everything in between.